For most of us, our first experience with a cafeteria is eating lunch at school. But many other institutions such as hospitals and businesses provide similar in-house food services. The people who prepare the meals are called Institution and Cafeteria Cooks. Often referred to as Foodservice Chefs or Executive Chefs, they have a big job to do. A large variety of foods need to be provided for hundreds, even thousands, of customers every day. For each meal, cooks prepare menus that often include soups, salads, entrees, side dishes and desserts. They work in huge kitchens, usually assisted by a staff of helpers. In addition to giving orders, this job requires following written directions, such as recipes. Being able to multi-task is important, since many items need to be prepared at the same time. Most of the shift is spent standing in front of hot stoves and ovens…or at the cutting board. Because you’re working with very large quantities, cookware is far heavier than what people use at home. Skills can be learned in vocational school or on-the-job. And although a high school diploma is not required it’s recommended, especially for those planning a career as a cook. Hours vary and may include early mornings, late nights, holidays and weekends. This could be a good job for those seeking supplemental income, flexible hours or variable schedules. 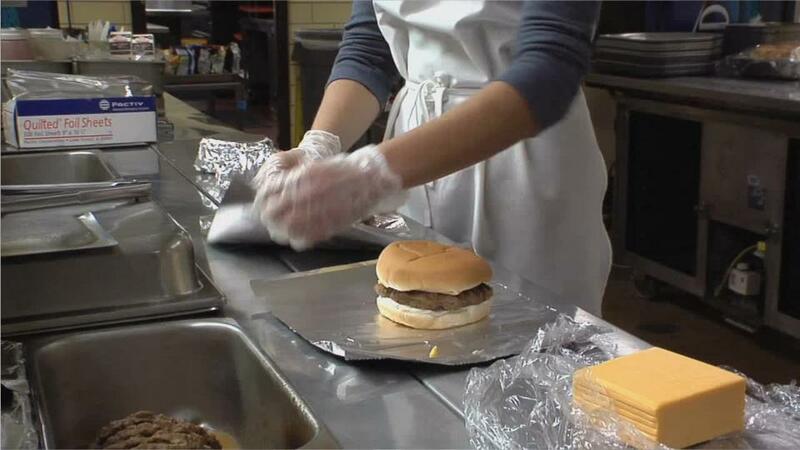 Whether serving hungry students or employees grabbing a quick bite, large-scale food services depend on the special talents of Institution and Cafeteria Cooks. See more details at O*NET OnLine about cooks, institution and cafeteria. Cooks, Institution & Cafeteria by U.S. Department of Labor, Employment and Training Administration is licensed under a Creative Commons Attribution 4.0 International License.